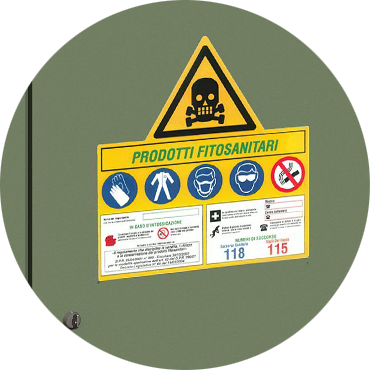 FIT 2, for the safe storage of plant protection products, pesticides or pollutants for the environment, is a monobloc sheet steel cabinet with ventilation on doors and roof. Body and doors painting with epoxypolyester powder reseda green color RAL 6011. Cabinet with declaration of conformity D.Lgs.81 / 2008, EN ISO 9001, EN ISO 14001, UNI tests on the product and finishes. Base on steel base, h. 100 mm. Body formed by panels 8/10 thick electro-welded, bottom, hat, back, sides with racks, 30 mm front thickness, with rounded edges. 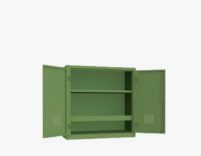 Hinged door, equipped with internal hinges with external rotation pivot with 180 ° rotation, reinforced rowing and anti-cut pleats on three orders, adhesive compliant with the law. Cylinder lock and double key supplied. Internal installation: 1 containment tank for 14 Lt. and 3 movable tank shelves on rack, complete with galvanized steel brackets. 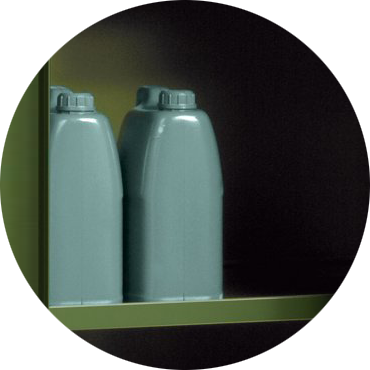 The European legislation regulating the use and conservation of Phytosanitary products requires the use of particular green cabinets, with collection tanks and appropriate safety signs. 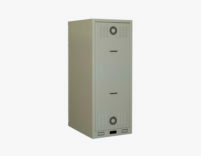 Armored monobloc video surveillance cabinet with removable back. 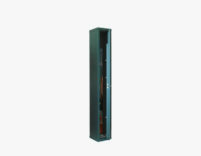 PFC 16081 is a cabinet made of sheet steel with a thickness of mm. 2. Double map lock. Equipped with ventilation doors and cable passage holes, removable back. Cabinet made in RAL 7032 textured grey color. 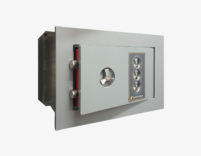 Fireproof cabinet for magnetic supports. 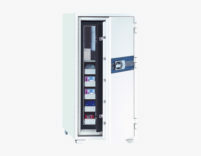 The TSBNDE cabinet of the Sicurfire Line is ideal for protecting magnetic and digital media. They guarantee a high protection against fire: resistance of 120 min. The cabinet is characterized by electronic closure. Armored display case with certificate of conformity. 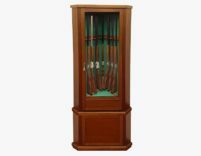 Showcase armored gun cabinet with shatterproof glass are ideal for safe storage and display of your shotguns. The triple display cabinet gives brightness. The textured paint of the armored cabinet PFVV3V gives the surfaces a realistic metallic appearance, with a finish able to give a 3D effect. 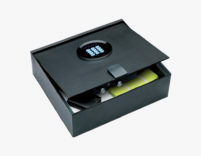 Double map key safe The SSK Safe is part of the hotel line that guarantees a valid application not only for hotels, but also for cruise ships, hospitals, campers. Available in light grey color. 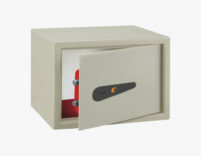 Mechanical combination safe. Extremely reliable mechanical locking system and avoids the problem of key management. 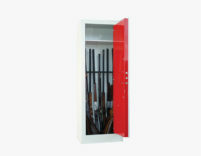 This wall safe is available in 3 colors: white (RAL 9001), grey (RAL 7031), black. 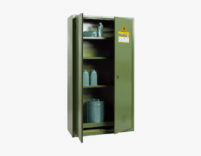 Plant protection deposit cabinet FIT 3 for the safe storage of plant protection products, pesticides or pollutants for the environment is a monobloc sheet steel cabinet with ventilation on doors and roof. Body and doors painting with epoxypolyester powder reseda green color RAL 6011. 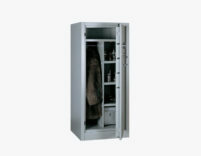 Cabinet with declaration of conformity D.Lgs.81 / 2008, EN ISO 9001, EN ISO 14001, UNI tests on the product and finishes. 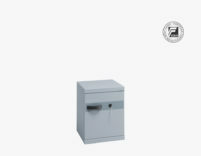 Plant protection deposit cabinet FIT 1, for the safe storage of plant protection products, pesticides or pollutants for the environment, is a monobloc sheet steel cabinet with ventilation on doors and roof. The closure is at triple expansion lock.